For the salt rub: Combine all the ingredients for the salt rub. Set aside. Take your pork belly and loin and score the skin into crisscross actions or prick it with the sharp point of your knife (you will have to prick it a lot so scoring is much better). After scoring the skin, make some cuts on the meat side as well, this helps get the flavours into the meat better. Sprinkle generous amounts of the salt rub over the meat section. You wanna use at least half of your salt rub. And it might seem like an obscene amount but it is not. Trust me. 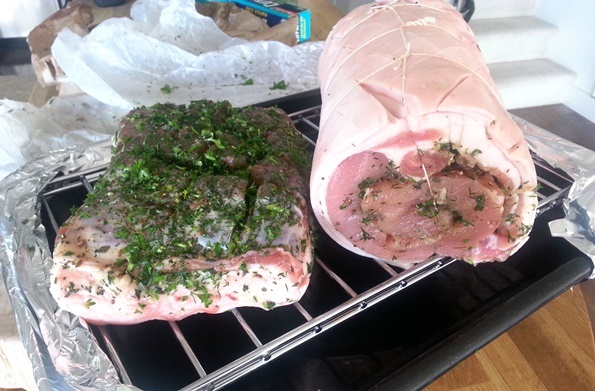 Massage the salt rub into the crevices of the cuts, you want the flavour of the herbs to get in there. Refrigerate overnight (or up to two days) on a wire rack over top a tray, covered with aluminum foil, because the salt is gonna do its thing and a lot of liquid is going to eke out of the pork. I’m a noob so I tied individual loop knots for each section. And that’s okay, you can do this too. Dab any excess liquid off the pork skin and sprinkle a big pinch of the salt rub and drizzle some oil over the skin. Massage and rub the the salt and oil evenly. It’s ready to roast! Heat the oven to 275F or 135C and cook the pork for 2.5 hours. You wanna go low and slow and it does two things: 1) the loin meat is going to stay juicy 2) the pork skin gets a chance to come up to temperature evenly in preparation for the heat blast you will give it for that delicious crackling. 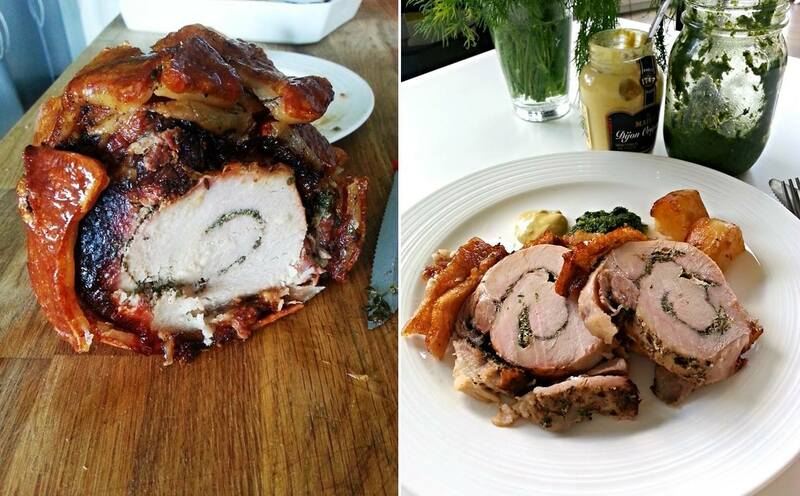 After 2.5 hours, crank up the heat to 450F or 230C and cook the porchetta for another 30-40 minutes. This step is important for crackling formation. You want the skin to bubble up and “bloom” because that’s how you know your crackling will be crispy. If the skin looks shiny, even and feels hard, it is not ready. You’re gonna break a jaw or two when you bite into it. Let the pork roast rest for at least 30 minutes before serving. Warning: The sound of your knife cutting through the crispy crackling may give you foodgasms. For the pesto: In a food process, blitz all the ingredient for the pesto (except oil) until fine. Stir oil in until you get a nice shiny paste. Making pesto this way retains the colour of the paste and I like the separation between chopped herbs and globules of oil. You can also hand chop your ingredients. You can make the pesto the night before or while you roast your porchetta. 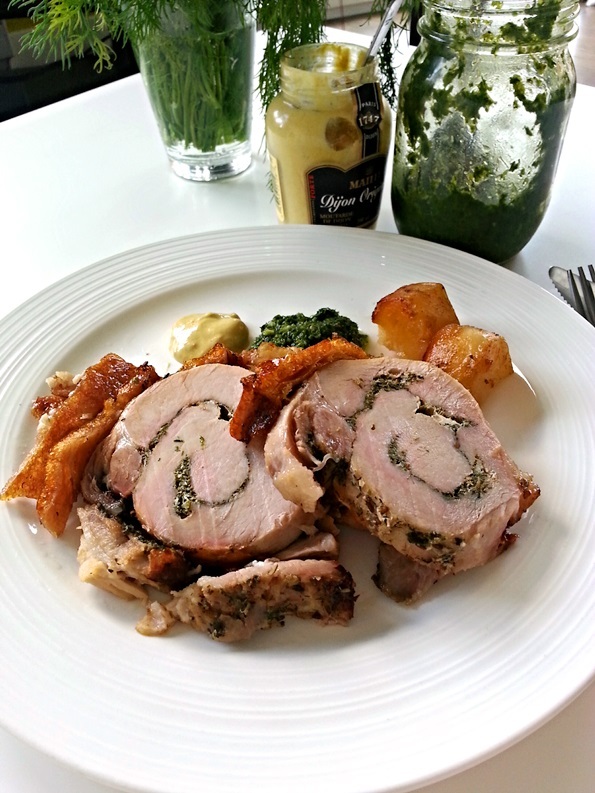 Disclaimer: In the midst of dinner and excitement, I forgot to take pictures when the porchetta came out of the oven. 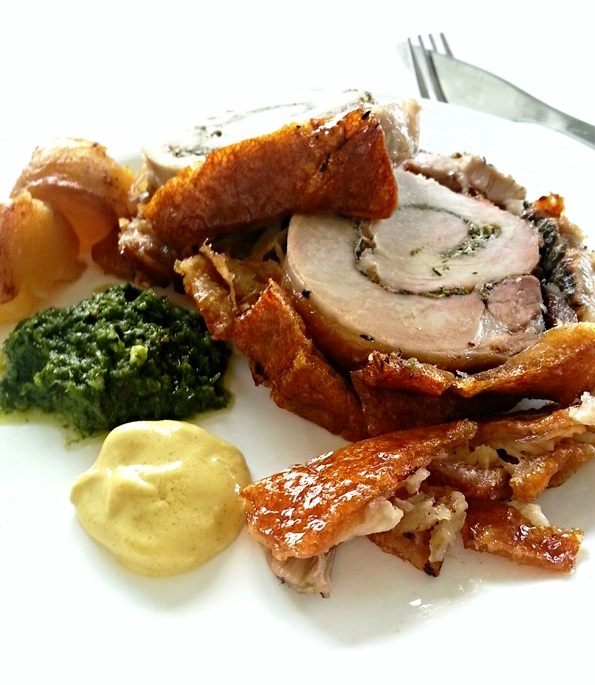 All the pictures are post dinner with left over porchetta.